Digg, the Betaworks-incubated social news service and new home to Google Reader replacement Digg Reader, has just arrived on Android, the company announced today. Included in this release are all the stories you would find on the Digg.com homepage, Digg Reader, as well as integrations with over a half dozen other services including Facebook, Twitter, Tumblr, Google+ and more. According to a post on the Digg blog, an Android app had been users’ most common request over the past two months, following the release of Digg Reader. The company has been working at breakneck speeds to push out its own RSS reader alternative to the now-shuttered Google Reader, which began with a launch of a somewhat unfinished product to the web this June, and a couple of days later, an arrival on iOS. Quickly swipe back and forth through Digg’s Top Stories, as well as through any feed or folder in Digg Reader. Choose from either the web view or the parsed text view. Digg or save any story; send it to Instapaper, Pocket or Readability (automatically upon save, if you choose); and share to Facebook, Twitter, Google+, LinkedIn, Tumblr, WordPress, Buffer, Dropbox, Google Drive, email, text or any other sharable app on your device. Sort your Digg Reader items by popularity to quickly see which of your items are the most talked-about on the social web. Log in to Digg Reader with your Google, Facebook or Twitter account. Search for and add new feeds. Create, organize and delete folders. If you so choose, post your diggs automatically to your Facebook timeline. However, the app is lacking a few option like a still-in-testing “Show Only Unread Items” view, text size and display mode options, and background updating, all of which are being worked on now for future releases. Digg says updates will roll out steadily over the next few months. Digg Android users have been fairly happy until now to use the company’s HTML5 website, which remains a decent way to browse the site on other non-iOS or Android devices. The company had previously explained that it sees Digg as a part of a broader suite of products, where Digg Reader and Digg.com’s collection of popular links are two ends of a spectrum. Reader, an RSS feed reading service obviously built for power users, is meant to serve as ground zero for beginning the news discovery process, while Digg.com’s final link collection is the result of crowd-sourcing voting and other filtering algorithms. In the middle, are things like Betaworks’ also newly refreshed Instapaper, a read it later utility, that saw its first major update this month, which was pushed to the public just yesterday. 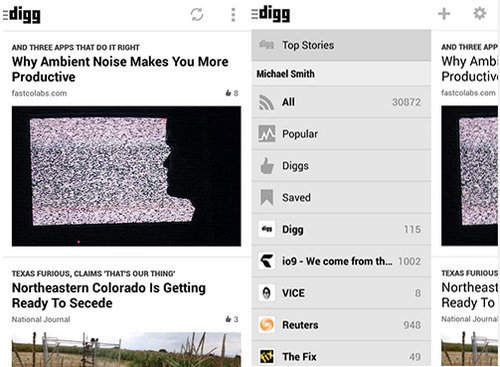 The new Digg Android app is here on Google Play.